I’m quite happy to receive two very nice comments on my last blog post, one from Miss Alice herself. I hope you try Miss Alice’s Magic Beans soon and enjoy them. I’m looking forward to the next time I can make some, but BF says “I’m all beaned out for a while.” But I made something fast last night that I thought I should tell you about. I also mentioned that my beloved Cuisinart toaster oven is now. . .toast. Oh, it still works, but. . .not well. Let me explain further. The model I have, I think, I bought about 2009 or 2010. It’s a well-built workhorse, and it’s done a great job for me since I bought it. The one I had before was a Christmas gift from the GER, and I used that heavily until the electrics went. Well, the front panel on this one, which contains the circuit board, come loose a while back. It was fine, I guess, until it got a little jostled in the move. We moved it to Neighbor E’s place, and it sat for a month until we moved it last week to my new location, and it was moved around a bit more, in the back of the pickup. I plugged it in, and the readout acted a little wacky, but after a couple of unplugs and re-plugs, it seemed to be working fine. I’ve been cleaning out the back room that will soon be my “studio”, and going in and out of the main part of the house. Not suspecting there was any reason to be concerned, I put a lovely pork loin roast into the beloved toaster oven and went about my business. I checked on it periodically, and the Herbes de Provence-coated roast was cooking along just fine. Until it wasn’t. I had an emergency. And BF was at work. I went back into the main part of the house and saw thick, heavy smoke. (Thank heavens the dogs are outside.) I went into the kitchen, and just saw more smoke–no flames, thank heavens, but SMOKE. Now, I’m accustomed to a little of it, particularly roasting things like turkey and chicken at 400F–my eyes burn a little, and I had to open up the patio doors to let that all out. Took a few minutes with the air conditioner cranked down to about 65F. Then the odor and smoke is gone, and I can go back to what I was doing. But this was the thick white smoke that comes from something burning. The next day I did some forensics–cleaned the whole thing up, but didn’t take any pictures. It was that bad! The drip tray was full of grease, and grease was baked onto the glass door. The square ceramic IKEA baking dish (similar to this one) was burned and broken into about six pieces from the center out, much like a large cookie–not shattered in a lot of little pieces. It was old, so I wondered if maybe it just had micro-fractures I didn’t notice and the heat did it in. Everything gets jostled around in a move, and we did have a few minor casualties, including broken glass. The breaking apart allowed the rendered-off fat to drip to the heating elements, then fill the drip tray and smoke up the house. Right? This where all my root-cause analysis and detective skills come in. See why I like to watch shows like Miss Fisher’s Murder Mysteries and Burn Notice? After I’d cleaned up that disaster and made it look shiny, I turned it on and set the temperature at 400F, which is what I use frequently (although the pork loin roast was set to 350F.) I left I it alone, and watched it while I washed dishes. I noticed that the convection fan was running, and it was getting pretty hot–but at no time did the readout indicate “temp ready,” which is what it’s supposed to do. So I got to thinking–maybe it wasn’t the dish? After I left the library on Monday, we stopped at Walmart for milk (as we do every couple of days, because he drinks more milk than a cow produces in a day), and I went to the kitchen stuff section to get a little inexpensive oven thermometer. I just sat it in the baking pan and repeated the test. Guess what? The temperature regulator is toast. The oven “works,” but it doesn’t stop at 350F or 400F, it just keeps getting hotter. That’s what fractured the baking dish into six pieces and allowed the grease to drip onto the heating element, smoking out the house. Had I used a stainless steel or aluminum pan, the roast probably would have still been charred, and it may have indeed smoked, but the metal wouldn’t have fractured like that. So. . .we’re debating on spending money on a new, and for now, less expensive toaster oven from <gulp> Walmart or Target. Or should we send this nearly $200 model to the Cuisinart repair place in Arizona, and spend a currently unknown amount of money to have it repaired? The circuit board will have to be replaced, and likely the entire front panel, since it’s not exactly attached anymore and hangs by two wires. Is it worth it to have this one repaired, or would it be better to buy new? If we do, it will likely be an Oster, Black & Decker, or Hamilton Beach; I would just take measurements on this one to make sure I get one that’s relatively the same size. Meantime, I’m using the big oven for everything, or the little one on the left. That oven thermometer will be used to check the temps on those ovens as well. This is what happens when life unravels. And sometimes, it’s highly annoying. Oh, well. . .so let me tell you about last night’s dinner. I haven’t made a frittata in a long time, and I figured, now is a good time to start making them again. Especially since there’s a hungry man in my environment. He was out in the workshop for a while, elbow-deep in some kind of car grease, and came in halfway through the show. Lidia was taking the frittata out of the oven, and turned it upside down onto a plate, much like you would a pineapple-upside-down cake. She’d sliced up some large tomatoes and put them on the bottom of the pan, added a couple of other things, and then poured the eggs over the whole thing. When it comes out, and you flip it, it has a lovely top. 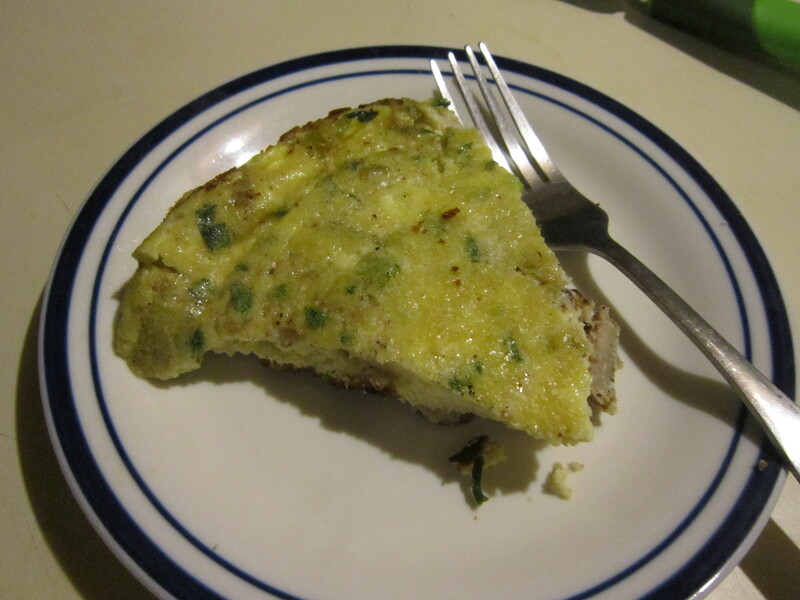 BF didn’t know what that was, and I told him–a frittata. He said he could do without the tomatoes. Lidia also answered a viewer’s question about using leftovers to create frittatas. Lidia said that was a great idea, because leftover meat and veg are perfect for creating one-of-a-kind frittatas whenever you want. That’s when I realized–I could make them too! Why haven’t I done this in a long time? If you really don’t know what either one is, think “egg pie.” Vegetables, meat, or a combination of the two, in a baked egg/milk or cream/cheese base that’s cooked on top the stove first, then put in the oven to finish it. It’s great for breakfast and brunch, of course, but also good for a quick lunch or dinner. The trick is to get started on it soon. . .and don’t wait until late like I did last night. I found a very basic recipe for frittata on The Food Network’s website, as well as more recipes and an explanation of the difference at Chowhound. Here’s a primer on them from The Kitchn, which I will probably bookmark on my phone so I can refer to it again one day. Lidia also has a YouTube channel, and you can search it for a number of frittata recipes, too–I just can’t find *the* one I saw last week. If you search Food Network’s website for “frittata,” you also will find a myriad of recipes. But I’ll show you what I did with ours so you can see how easy and varied they can be when you’re wondering what you can make that’s new, or you have leftovers to use up. I call it The Use-It-Up Frittata. Because that’s what I did–and I didn’t want to mess with a Red Baron Pizza. I didn’t use all of them but don’t worry, they’ll grow back soon. Always, always. I’m determined to grow Hatch chiles in rural Louisiana. Turn the oven on when you’re starting to cook on top the stove. You don’t want to wait for the oven to heat up. I recommend 350F, I think 375F was too high. See why you chop it small? The eggs and milk work well together, especially here. Yes, the infamous green bottle. This is why the 8-cup bowl is best for this kind of thing. Blitz! The egg mixture doesn’t go flying all over the place. And it pours easily. Don’t forget to use the spatula to get every last bit of egg, milk and cheese out of the bowl and into the pot! I love it. It’s quick, easy, and because the pork chops were already cooked and seasoned, I didn’t have to do much of that. But what did the man of the house think? Yes, he really said that. And I did make him one, in the same skillet. I’ll be eating frittata for breakfast this week while he has some cereal and milk. That’s what he likes. I asked him why he didn’t like it, and he said that it was “just too many flavors going on at one time.” So if I ever attempt a frittata again, I’ll have to tone down the flavor combinations and follow a recipe. (Not like there aren’t many around.) I felt bad that it didn’t live up to expectations, and it wasn’t as special as I thought it was. He appreciated the effort, but just didn’t like the finished product. And now the word “frittata” will be, in his mind, synonymous with something awful. Meantime, we’re doing what we need to around the homestead. BF has taken vacation time next week (the “use it or lose it” type) and it also happens to be. . .my birthday! Gifts don’t always come wrapped in a box. No Denny’s around, but I’ll be getting my yearly free salad (or something) from Starbucks, and maybe one or two other “birthday free things” I can find. Well, I knew I would miss some things when I moved here. Y’all, frittatas are a great way to make a quick egg dinner for yourself, your family, as well as breakfast, brunch or lunch. Heck, really, anytime you’re hungry and have a few minutes. Except for The E Man. Unfortunately, he’s allergic to eggs. My sincerest apologies to you, my friend. So will you try it this week? If you’re in an area where it’s already cold, frittatas can really fit the bill any time. Here in the south, it’s not a long oven time, either.